The Canon IRC-3580Ne is an all-in-one colour laser printer designed for all-around office use. The device prints, scans, copies, and sends out fax at decent rates. It is a step above previous Image Runner models that only offered monochrome printing. With the addition of colour printing, the Canon IRC-3580Ne is an excellent device to complement your document production and handling system. The device even has an optional interior or external finisher unit, which adds to its versatility. However, the device requires ample space for smooth operation and print rates slow down as printing size increases. 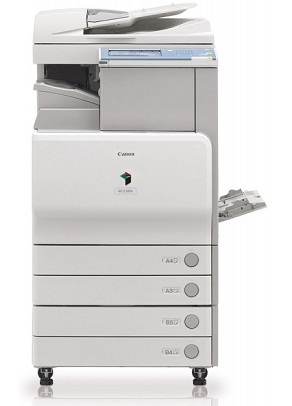 The Canon IRC-3580Ne has a standard all-in-one design. It features an automatic document feeder on top of the flatbed scanner, which allows easier processing of multi-age documents. The device even has a built-in duplex unit and a fax modem that allows quick fax transmission. It has an LCD panel for controls, and a standard media tray that can hold as many as 550 sheets. Built for heavy printing, the Canon IRC-3580Ne also has expandable paper input capacity up to 2250 sheets. High resolution printing is guaranteed with the Canon IRC-3580Ne. It can produce up to 1200x1200 dpi images via its colour laser beam printing technology. The device also supports colour copying, scanning and fax, while offering advanced features like direct printing and scanning from memory, copy enlargement and reduction, double sided scanning, printing, and copying, and group and speed dialling for convenient fax sending. The Canon IRC-3580Ne is a reliable all-in-one device, but the print speed suffers when printing larger and higher resolution documents. Average print speeds for A4 documents are 35 and 30 ppm in black and white and colour.